In the image to the left, you can see that the stucco has completely fallen off of the wire lath. Rusting wire lath has resulted. Wood behind is rotten and completely missing. Unfortunately, this is a very common occurrence. 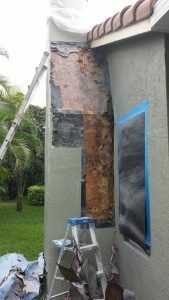 In this case, the homeowner paid several contractors to repair it but the problem persisted because they simply tried to seal the stucco instead of replacing it. The next image shows the rotten wood behind the wire lath and stucco. In many cases the wood is completely missing. Our chimney repair company crews use pressure treated lumber when repairing chimney structures to ensure the rotten wood can’t come back. 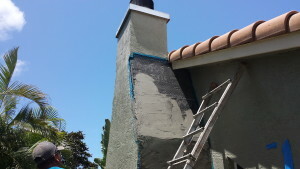 We recommend painting the chimney every three or four years after we have completed repairs. This prevents small cracks from forming in the stucco again and cause a repeat of the problem. We provide professional chimney repair companies results. New stucco application begins when the rotten wood and rusted wire lath is completely replaced. There are three coats for stucco application. These are scratch, brown and finish coats. Each layer of stucco needs ample drying time between each coats . As a result, these repairs can span several days and trips. We call new stucco “thirsty”. The first coat of paint soaks in like water to a sponge. It takes several coats of paint to get a good finished look. It takes stucco somewhere between 45 and 60 days to cure. During this time the PH stabilizes. Paint should not be applied until this takes place. The chimney "flue" is the pipe within the chimney that carries the smoke from the the fireplace up and out. On the top of the flues or square cap. This "flue cap" can bee seen at the very, very top of the chimney. The flue cap has two functions. First, the flue cap prevents rainwater from entering in to your home. Second, the flue cap serves as a "spark arrestor", preventing fire embers to rain down outside of your home and causing a potential fire. 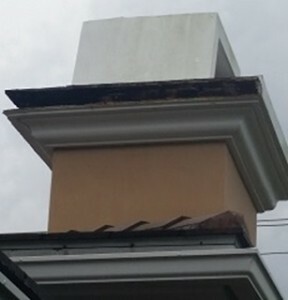 The chimney cap is the metal cap flashing on top of the chimney structure. 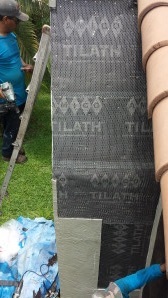 We make our chimney and flue caps with aluminum. Aluminum does not and lasts much longer than galvanized metal caps. 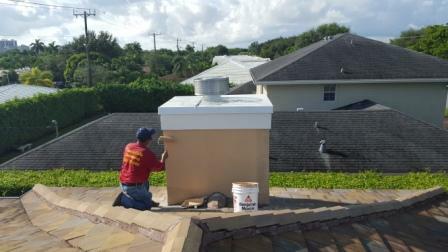 Hire a chimney repair contractor that can use aluminum. Fireplace and Chimney repair is an important and integral step to maintaining your building envelope. The chimney cap covers the top of the chimney structure, sometime called the crow. It is usually made of galvanized metal. Galvanized metal over time can rust so, we can upgrade the chimney cap to copper, aluminum or stainless steel. There is a up-charge for the upgrade. We fasten the cap on the crown using screws and neoprene washers. This is because it is not aesthetically please to see them on the side. The chimney flue is a double wall pipe the exhausts the fireplace hot gas. It has inner and outer walls. The outer wall stays cool enough for the flue to be fastened to wood framing if needed. The flue starts over the fire box and extends up and beyond the cap. The chimney damper is a swing gate that opens or blocks the flue. When closed it stops air from moving in or out of your home. If you start a fire with it closed, smoke will backup into your house. Left open when the fireplace is not in use and your cool air can vent outside. 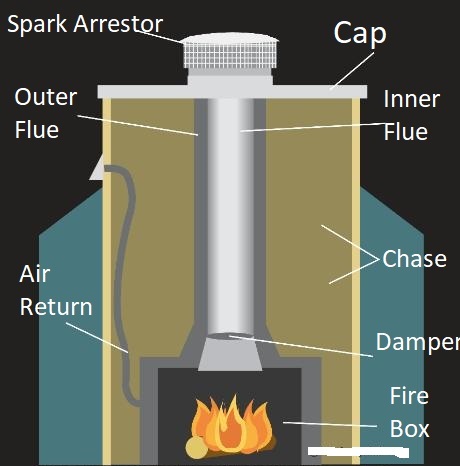 The spark arrestor sits on top of the chimney flue. Wood fires release hot embers and sparks up the flue. They can drift over and land on top of your roof. The spark arrestors job is to stop sparks from doing that and possibly starting a fire. The chimney fire box is obviously the chamber wood is burned in. Your chimney may not have an air-return. The job for the return is to supply additional usable air for the fire place. A chimney has to be 3' taller than where it exists. It must also be 2' higher than the roof within 10'. But, taller chimneys are better. Hot air is lighter than cool air. A tall column of hot air generates a pressure differential. The affect is accumulative. So a 20' chimney generated a pressure differential twice that of a 10' chimney. Keep in mind that your chimney competes with appliances, windows and skylights. A couple of bathroom vent fans and a kitchen stove hood Could reverse the air flow of the chimney. 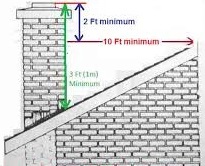 Now you can understand how important it is that a design professional calculate the height of your chimney. And, that it is not altered for any reason. Chimney repairs and Stucco wall repairs are basically the same thing. Do you have a stucco wall the needs repair?